Woody Allen. There: Now I've said all I need to say to let you decide whether you want to continue paying attention. Those words may be as contentious as any in contemporary movie-fan circles—or at least on a par with "Marvel Cinematic Universe" or "Oscar-worthy," albeit for completely different reasons. From the scandals and accusations in his personal life to his homogenous, hermetically sealed on-screen worldview to the widely varying quality of his recent work, there is no DMZ in a conversation that involves Woody Allen. His movies don't just arrive with baggage; they're an overhead bin that couldn't possibly fit all the baggage. Magic in the Moonlight is in many ways a paradigm for 21st-century Woody Allen cinema—and that's perhaps also indicative of its biggest problems. Once again, he's giving us a period-piece milieu, in this case 1928; once again, he's taking us to a European location. And once again, he's made his protagonist a misanthropic artist/entertainer. His name is Stanley (Colin Firth), though he performs as a touring stage illusionist under the name Wei Ling Soo. In addition to his theatrical performances, he also delights in acting as a debunker of fraudulent mediums and diviners of all kinds, intent on proving his conviction that there's nothing beyond this world that isn't trickery and/or wishful thinking. So when he's informed by an old friend that a young woman named Sophie (Emma Stone) is enjoying the patronage of a wealthy family in France while claiming to make contact with the dead husband of the matriarch (Jacki Weaver), Stanley is more than happy to take the job of exposing her as a fraud. Once again, it's hard not to drag Allen's personal life into his work; Film Comment's Nicolas Rapold puckishly observed that the premise involves "an older entertainer trying to prove that a young woman is lying." And while it's still unsettling watching yet another Allen movie in which the age difference between the romantic leads is approximately a generation, it's also hard not to acknowledge that such an approach simply follows the standard Hollywood model for May-December relationships in which you better believe the dude is gonna be December, and maybe the girl is actually more early April. But on a more rudimentary level, this is just a tedious slog of a movie to sit through. Allen generally has two speeds—his frothy romps, and his more serious philosophical meditations—each of which has produced great work over the years, perhaps most often when he figures out how to combine the two. 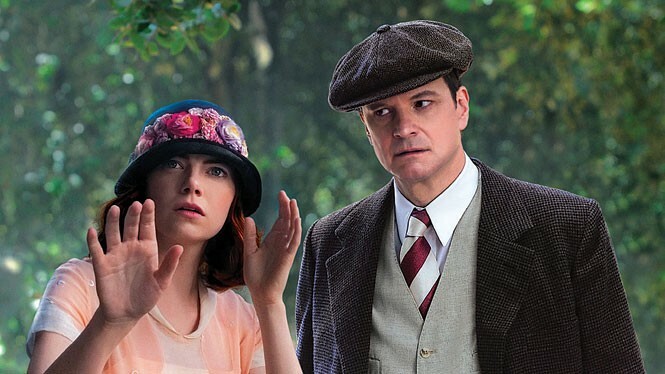 What little attempt at comedy there is in Magic in the Moonlight, however, feels utterly leaden, both because the typical Allen witticisms now often feel recycled, and because Firth seems like exactly the wrong actor to make them work—too solid and straightforward to come off like a wiseacre cynic. And it's even more frustrating as a treatise on a specific philosophy, because there's absolutely nothing about that philosophy that's new. The narrative takes a twist when Stanley becomes increasingly convinced that Sophie's psychic gifts are the real deal, shaking his earthbound prejudices to the point where he actually prays when his beloved aunt (Eileen Atkins) is injured in a car accident. Yet Magic in the Moonlight ultimately plays as a repudiation of that comforting spirituality, and a return to one of Allen's most frequently recurring para-Nietzschean thesis statements: that existence is meaningless, and only romantic love provides any point at all. It is, of course, a perspective that repeatedly defends Allen's infamous "the heart wants what it wants" quote, and the frequency with which he has hammered at it in movie after movie over the course of 40-some-odd years makes it look more than slightly defensive. Allen is too fundamentally competent a writer and filmmaker to make complete garbage, and too much of a legend for talented actors like Emma Stone—who's appealing enough in a fairly standard-issue late-period Woody ingénue role—to be able to resist working with him. Yet it's ironic that the primary knock on him tends to be that he's not the filmmaker he used to be. To the extent that he's slipped, it's because he's spinning his creative wheels. He's more or less exactly what he used to be—and that's just not going to be good enough if he ever wants to change the conversation. Magic in the Moonlight is not showing in any theaters in the area.